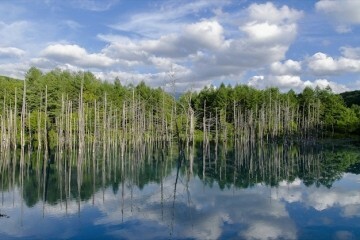 Lake Saroma is a brackish lake that is surrounded by the city of Kitami and two smaller towns, Saroma and Yubetsu. 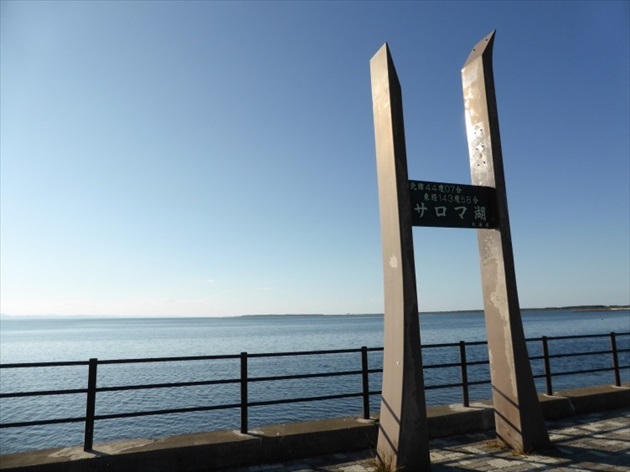 Its area of 152 square meters and 91 km perimeter make it the largest lake of its kind in Hokkaido, and the third largest in Japan. 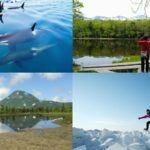 The sand bar that separates the lake from the Sea of Okhotsk is roughly 25 km long with widths ranging from 200 to 700m, where there are the primeval flower garden, forest parks, and other features located on it, has something to enjoy in every season. 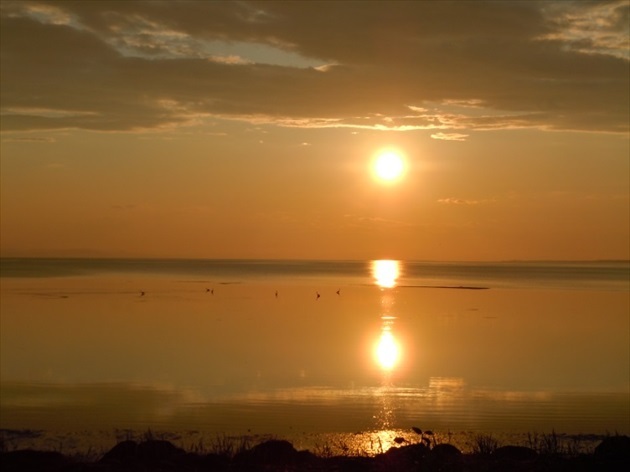 Lake Saroma provides a connection to the Sea of Okhotsk. Its beautiful, unique blue is known as “Saroma Blue,” and never fails to enchant visitors who come to see it. Sunset is one of the best times to come and see the lake. Lake Saroma is also a popular destination thanks to its sunsets. There are places to check out all around the lake. The beauty of the evening sun sinking into the lake will leave you speechless! The view is one that leaves visitors enthralled, wishing it would last forever. Lake Saroma is also known as the birthplace of scallop aquaculture. 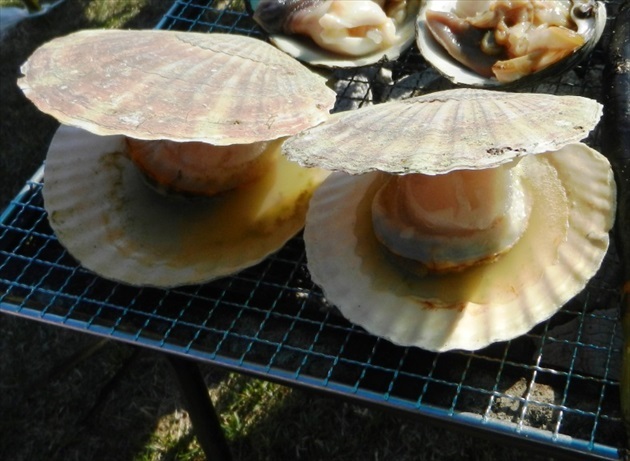 The lake has several areas that produce scallops, and once boasted the biggest catches in Japan. The large, sweet, and firm meat of these scallops is what makes them truly special. 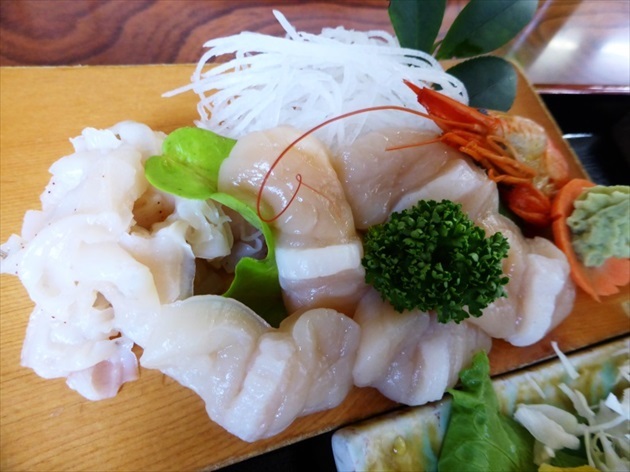 These scallops can be enjoyed in a variety of cuisines around the area, including as sashimi. The area around Lake Saroma features a variety of attractions, from places where amazing views of the natural environment can be enjoyed in all four seasons, to places that are fun for the whole family. Here we’ll introduce some attractions and other things you won’t want to miss as you take a sightseeing drive around Lake Saroma. 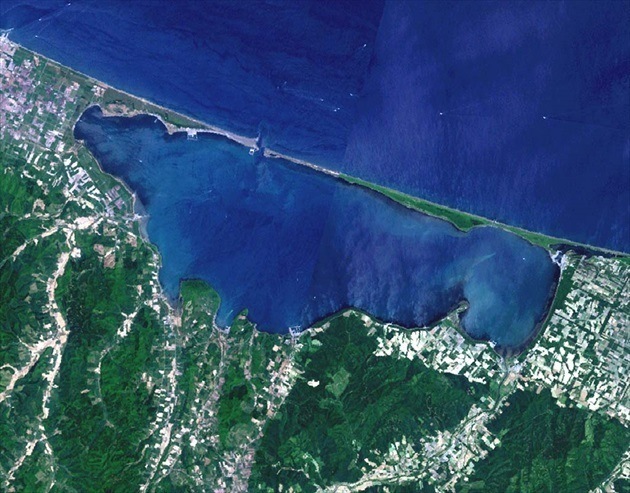 The Wakka Primeval Flower Garden is located on a sandbar, which stretches to form a roughly 25km connection between the Sea of Okhotsk and the Lake Saroma, ranging from 200 to 700m in width. 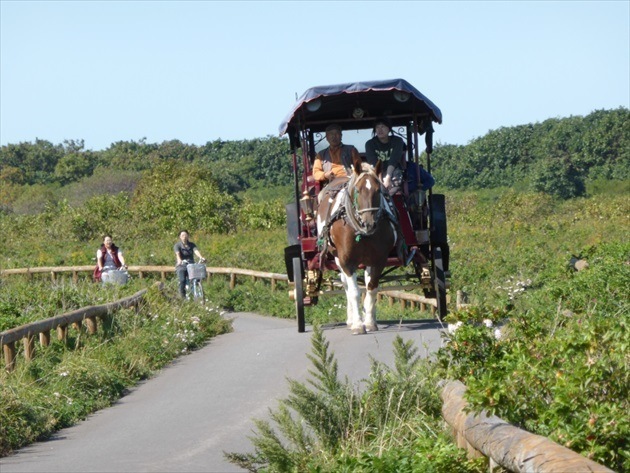 This park, which is part of Abashiri Quasi-National Park, one of the largest in the country, draws tourists and other visitors with some 300 types of flowers that bloom from May to September. 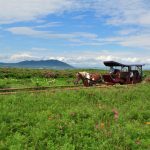 With a variety of routes to choose from, visitors can take their time walking and gazing at the flowers, enjoy cycling in the gentle breezes of Okhotsk, or take a leisurely ride on a horse-drawn sightseeing buggy, a “Dream Wakka,” for a higher vantage point. 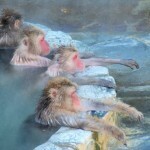 These priceless Okhotsk views were selected as Hokkaido Heritage in 2001. 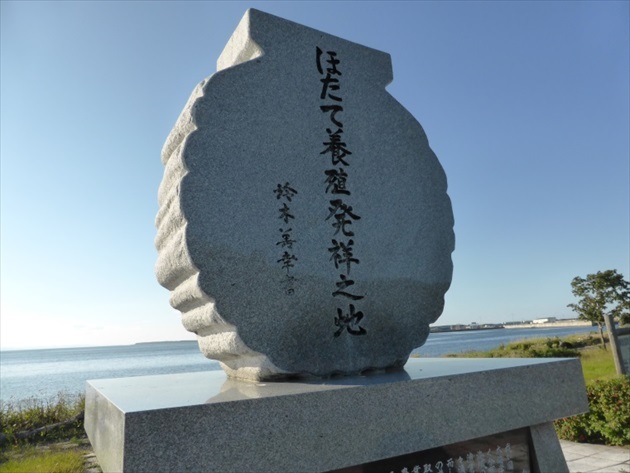 Also called the “Road to the Palace of the Dragon King,” this stretch is known for being a place where marathon runner Toshihiko Seko ran when training for the Olympics. 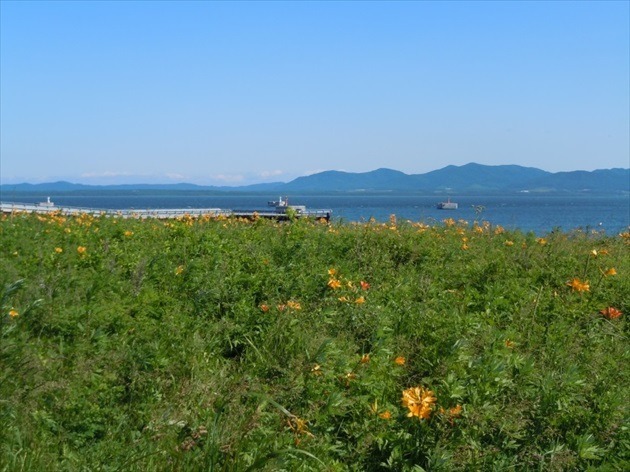 Come and experience the breathtaking views that can only be found in the abundant nature of Okhotsk at the Wakka Primeval Flower Garden! 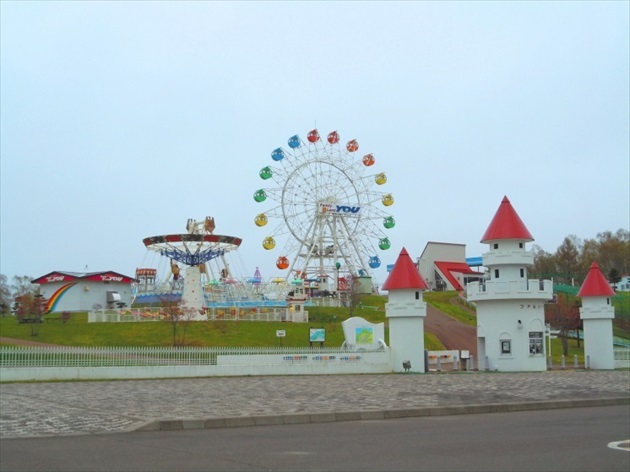 Family Ai Land YOU is an amusement park on a small hill on the western bank of Lake Saroma. 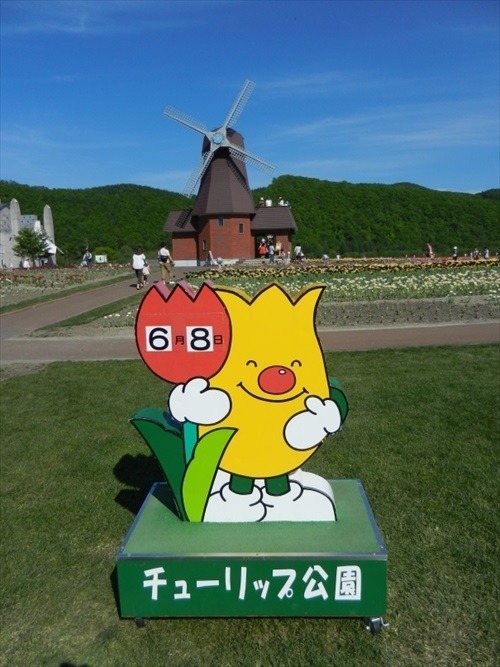 The amusement park is situated along National Route 238, and shares facilities with Michi-no-eki Ai Land Yubetsu, making it a popular place for visitors to stop at during their drives. With more than 20 different rides and other amusements, including a cycling monorail and an 800-meter go cart track, Family Ai Land YOU offers fun for adults and kids alike. One of the highlights, literally towering over the rest, is the ferris wheel. 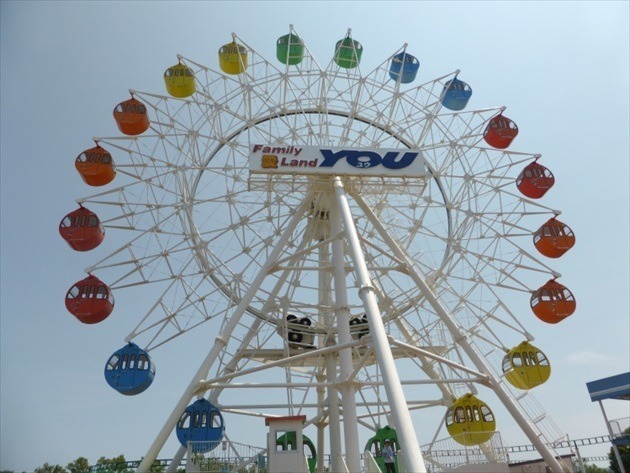 This is the only ferris wheel in Japan that allows a full view of Lake Saroma. The view from the top is amazing! Nowhere else can you find another seat that gives you an unimpeded view of this scenery. From the top visitors can also see the Ikoi Forest, with a footpath that continues on down to the lake next to the amusement park. 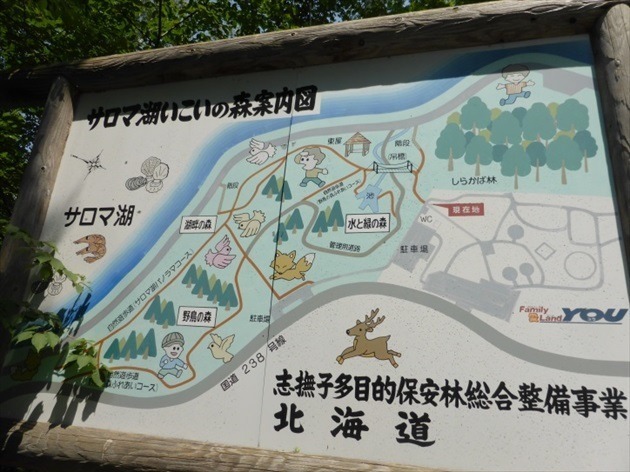 This 2.4 km path is perfect for an immersive walk through the forest that offers clear views of Lake Saroma. This is a little-known gem. Try taking a stroll here! 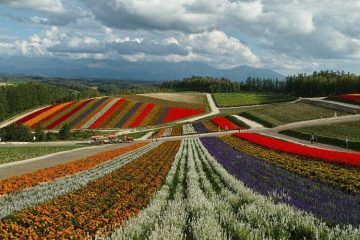 Spring: The season for flowers arrives in the Okhotsk region right around Golden Week(in the first week of May). 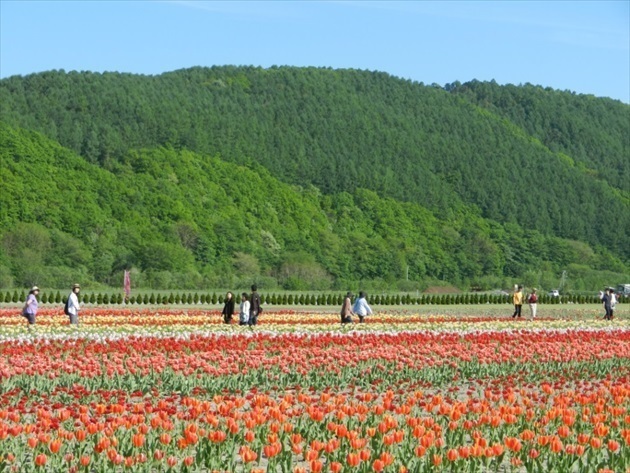 At Kami-Yubetsu Tulip Park, just a 20-minute car trip from Ai Land YOU, fields full of splendid tulips bloom every year from the middle of May to early June. The piece de resistance here is the view of these 70,000 square meters of fields blooming with more than 1.2 million tulips, including some 200 different varieties. 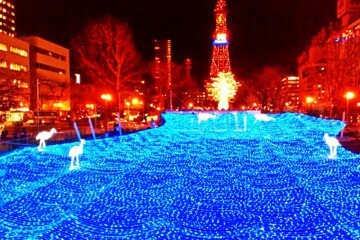 The giant Dutch windmill might even make you forget momentarily that you are still in Japan. This windmill in fact doubles as an observatory, allowing visitors a high place from which they can look down over the vast expanses of blooming tulips. 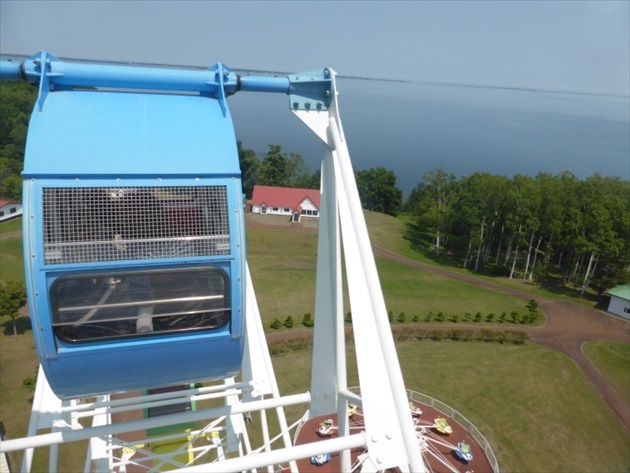 Enjoy the amazing 360-degree view of the scenery! 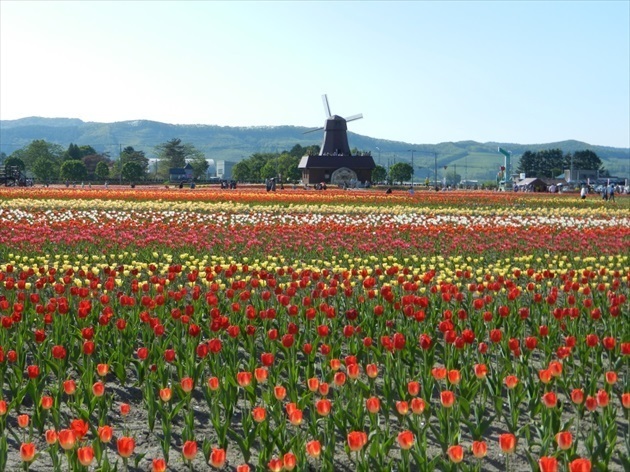 The Tulip Fair is held every year during the flowering season, bringing many visitors for sightseeing. 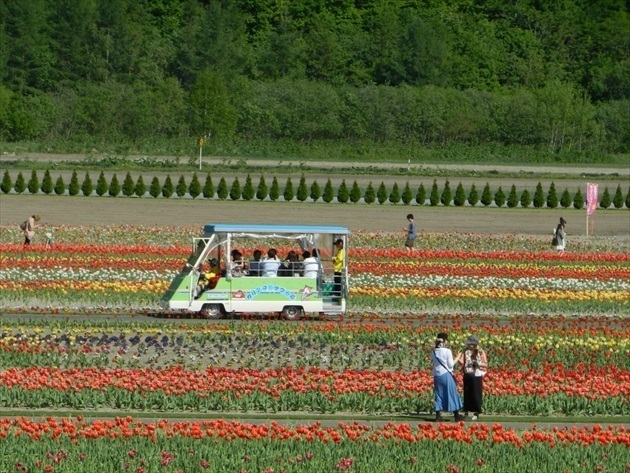 In addition to the an array of food stalls that allow visitors to enjoy the local cuisine, they can also try digging out tulips themselves, or take a ride on the electric-powered bus (Tupit) through the flowers. When visitors ride Tubit, guides not only provide information on features within the park through its sightseeing guide, but also point out prime photo spots. One other attraction in the part is the Jumbo Wooden Clog created by a Dutch craftsman. 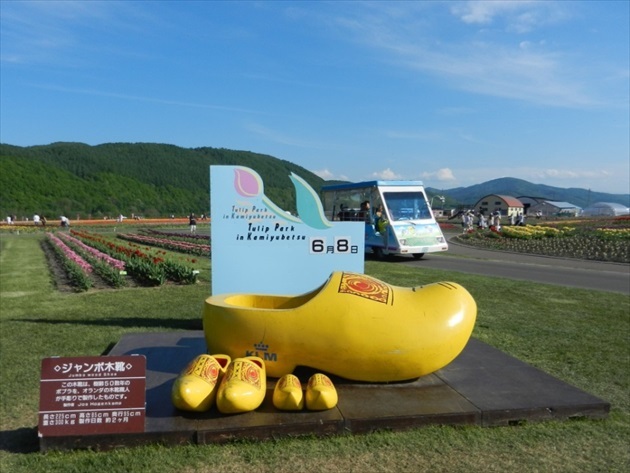 Weighing in at 300 kg, and 225 cm tall, this clog is big enough to fit a whole person inside, making it a popular spot to take photos. 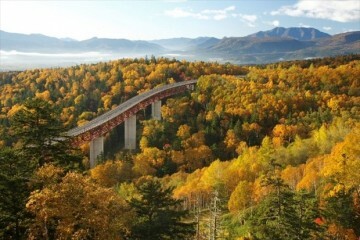 The romantic scenery has the power to make you feel like you’ve left Japan, while also showcasing incredible and expansive views of nature that can only be found in Doto Okhotsk. When visitors come all the way to Lake Saroma, they tend to want to make the most of the chance to sample fresh seafood from the lake, especially scallops. Here we’ll introduce some recommended foodie destinations in the Lake Saroma area. 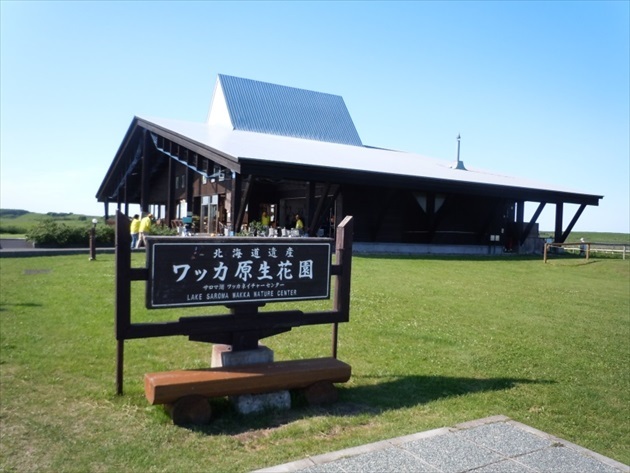 Rest House Tokoro can be found along National Route 238 (the Okhotsk Line) in Tokoro, Kitami. It’s a popular lunch option not only for tourists but for many locals as well. 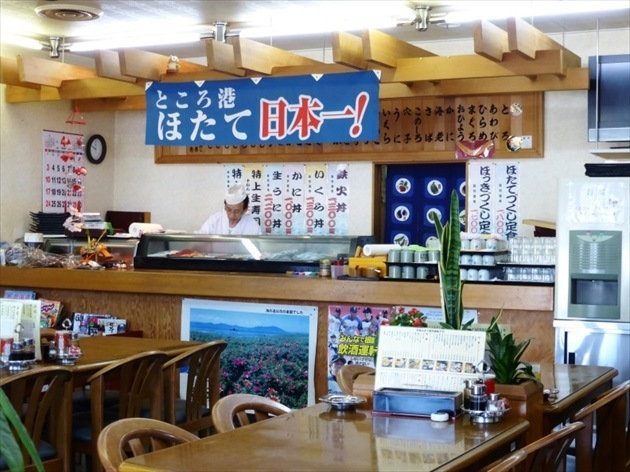 A sushi counter can be found inside, lined with fresh seafood. 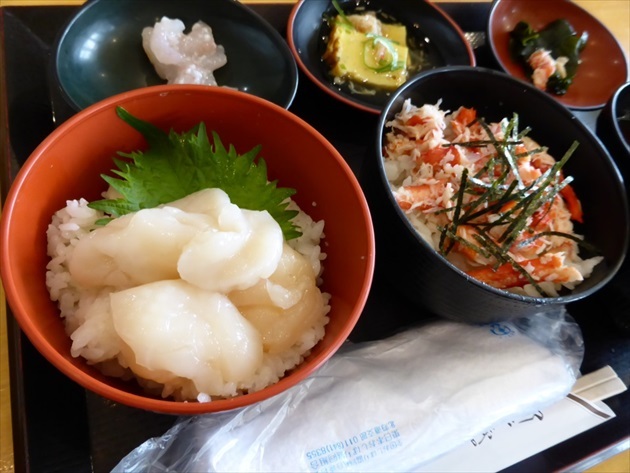 The massive menu features 100 different dishes, including curries, ramen, and plenty of others that use fresh seafood from the Sea of Okhotsk and Lake Saroma. The “scallop everything meal” brings together scallop sashimi, fried scallops, scallops boiled in brine, scallops cooked in sweet soy sauce, and fermented scallops all in one meal. There are young scallops in the miso soup as well. This is a must for anyone who loves scallops. The sashimi is nothing but scallops, including everything from the adductor muscle to the mantle. The sweet meat is thick and plump enough to satisfy anyone. 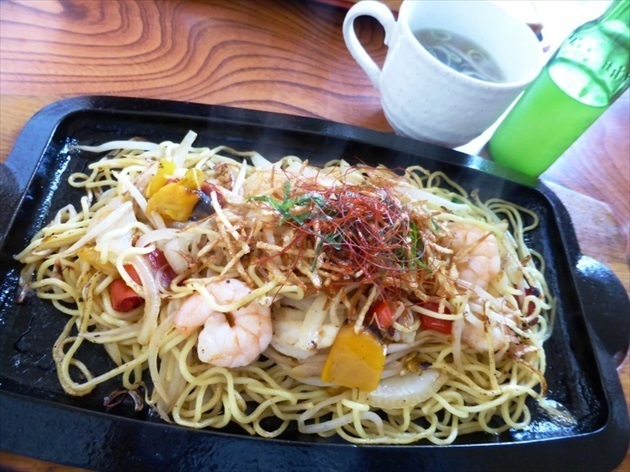 Visitors can also try another local dish that’s popular in Kitami: Okhotsk Kitami salt yakisoba. This is a dish of fried noodles that incorporates scallops and onions produced in Kitami, finished with “Magic Water” (scallop extract) for extra umami(tastiness). You can try adding a squeeze of lemon juice for a brighter and more refreshing flavor. 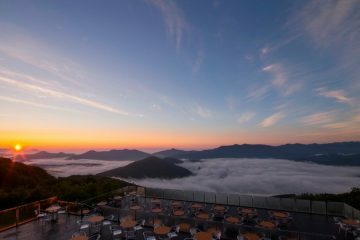 Rest House Tokoro’s menu offers seasonal Okhotsk flavors throughout the year, with scallops over rice, sushi, and the “oyster everything meal” in the oyster season. Make sure to stop by for a snack on your drive through the area. 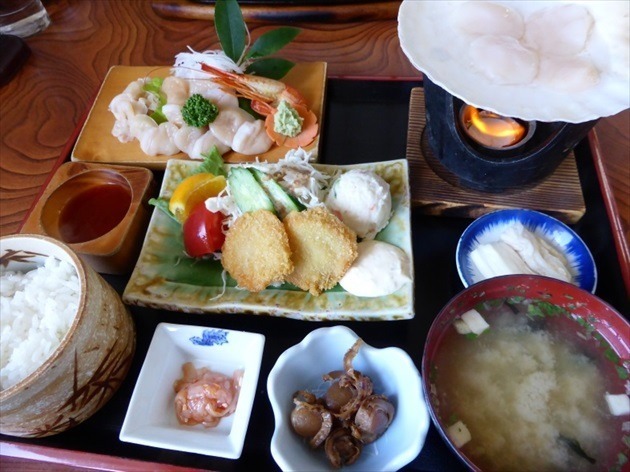 Ryoshi-maru: The Captain’s Place can be found across from the Lake Saroma Tsuruga Resort. A popular spot for visitors to stay, The Captain’s Place also serves lunch. The Captain’s provides front-row seats to Lake Saroma. You won’t be disappointed by the fresh seafood straight from the Sea of Okhotsk and Lake Saroma. Late March to June, right after the drift ice has cleared out, is a particularly rewarding season for seafood lovers. At The Captain’s, visitors can enjoy scallops and crab at the same time when the ice clears in spring, including dishes that can only be found in that season. The set here comes highly recommended, combining two donburi ricebowls and three small side dishes with miso soup. Visitors can also sample a wide array of flavors with choices like the three- and five-topping donburi. 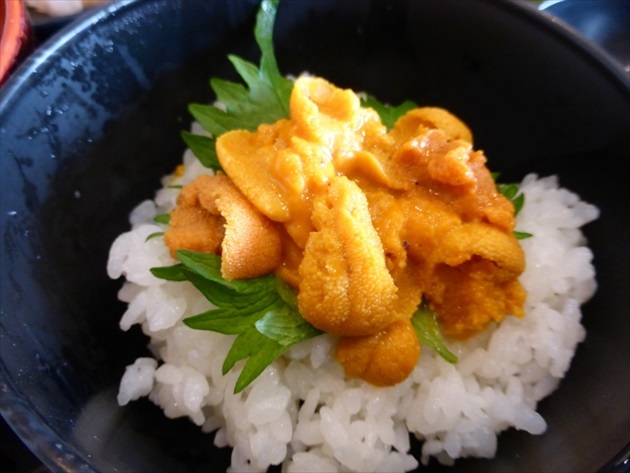 In spring, the sea urchin over rice (donburi) meal is a great option. The sweet, creamy sea urchins are not to be missed! Sea urchin tends to come with a luxury price tag, but visitors will be pleasantly surprised by how affordable they are here. 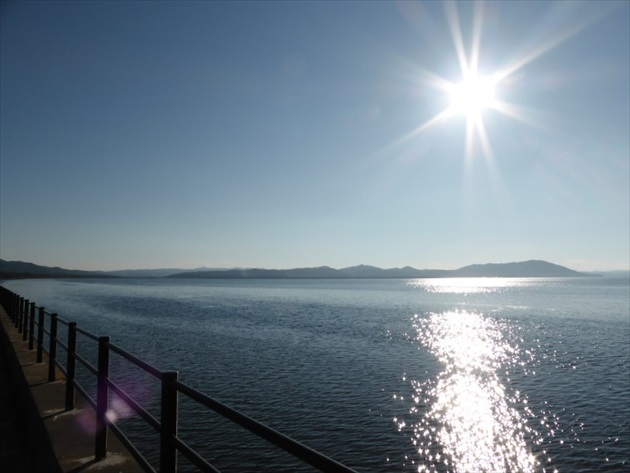 The bounties of both Lake Saroma and the Sea of Okhotsk can be enjoyed throughout the year: horsehair crabs and sea urchins in the spring, Hokkai shrimp in the summer, and oysters in fall and winter. 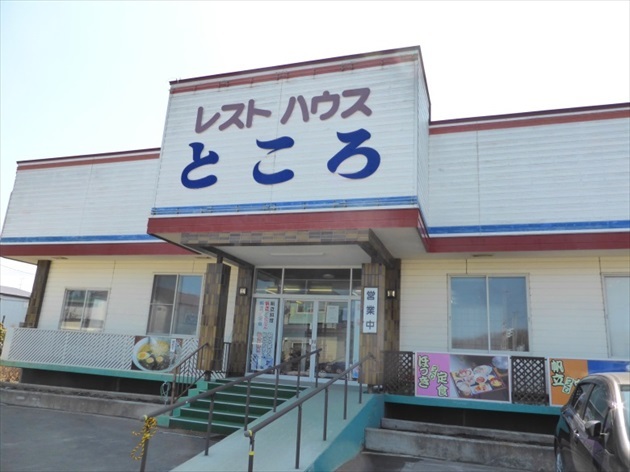 Okhotsk in the driving season is a great place to get lunch for anyone who wants to get a taste of all the seafood that the local waters have to offer. 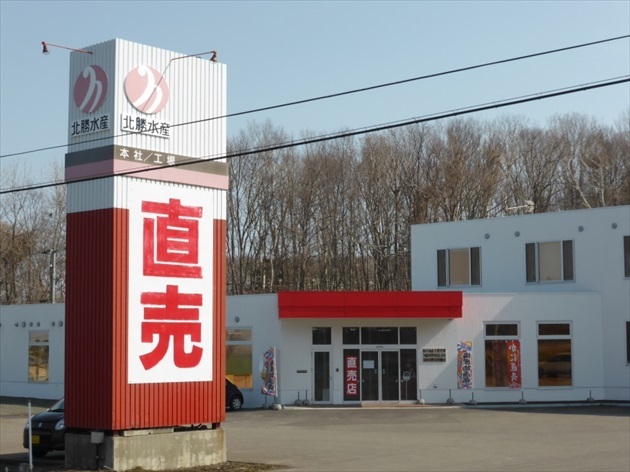 Hokusho Suisan(a seafood wholesale) is also located in Saroma along National Route 238. 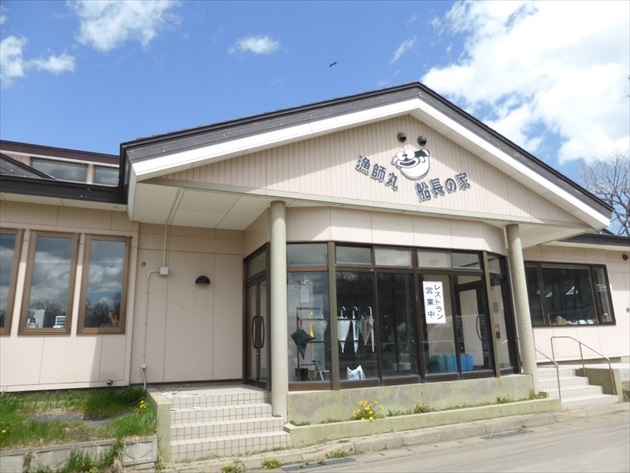 Right next door to a fishery, Hokusho Suisan carries seafood products made from the catch of the season and other special delicacies. With Lake Saroma right across the street, the freshness of the seafood found here is guaranteed. 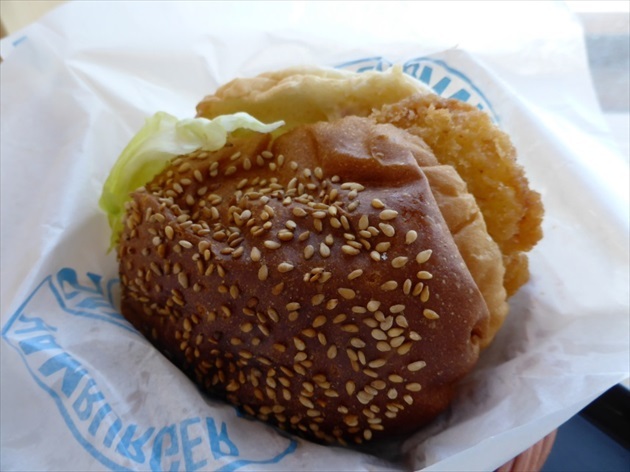 One of the top recommendations here among those in the know is the scallop burger. This burger brings a generous helping of large, locally-produced fried scallops on a bun. The piping hot fried scallops on a fluffy bun are perfectly complemented by fresh lettuce, tomato, and tartar sauce. This unique taste can’t be found anywhere else, so be sure to make a stop here during your drive! Burgers can be taken to go, but the shop also has a dining space with a great view of Lake Saroma. There are so many fun things to do and delicious things to eat near Lake Saroma. 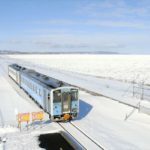 The stretch of National Route 238 known as the Okhotsk Line, which runs along the coast of the Sea of Okhotsk, is dotted with the places where visitors can enjoy therapeutic views of Doto nature and the seasonal flavors of the Sea of Okhotsk and Lake Saroma. Heading into summer, the Okhotsk Blue takes on an even more delightful radiance, making it the perfect season to enjoy a relaxing drive and feel the refreshing breeze. Come and take your time exploring Okhotsk to discover the delicious food and great fun to be had here!